As has been my wont the past few years, I took the week after Labor Day for my annual painting trip. This year I decided to revisit Acadia National Park; I was last there 15 years ago, when I brought my nephew David along. This year as a bonus, my wife took the kids (and a college friend) to her sister’s summer place in Port Clyde, so I spent two days with my family before they headed south and I headed north. We rented a car Friday evening. Saturday morning, Joanne headed into Boston to pick up Sara, Emalie, and her friend Kate. I hit the road for Maine a little before 8. Joanne thought a painting of the sheep at the farm stand across the street would make a good Christmas present for her sister. 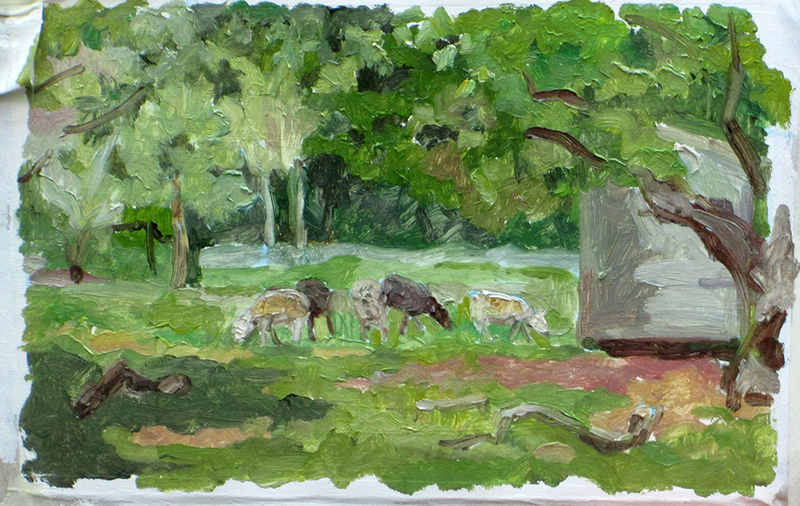 I set up and started to paint, at which point the sheep all wandered away. I determinedly went on painting and the sheep came back in dribs and drabs, enabling me to finish the painting. The title is, I believe, self-explanatory. Impressive thunderstorms that night, with torrential rain. The next day I left for Acadia. Very foggy day. 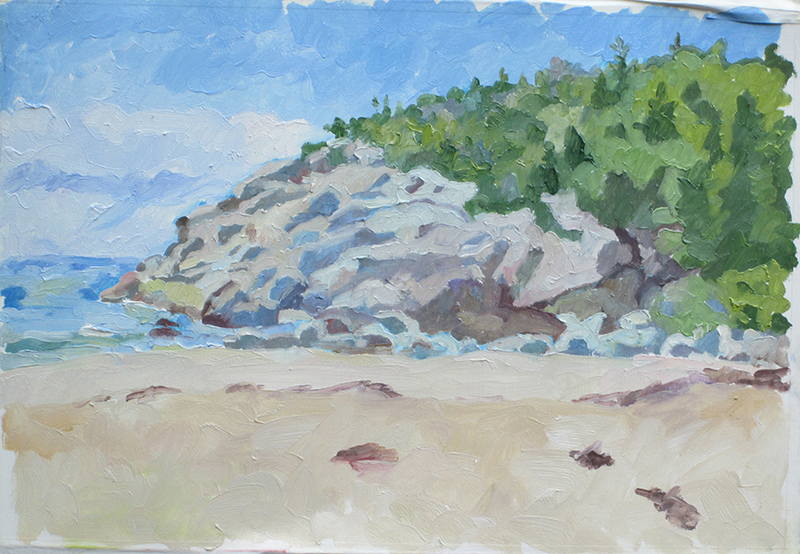 I drove straight into Acadia, bought a pass, and parked at Sand Beach to paint. While I was painting I chatted with a woman who turned out to be from Stamford, CT. In fact, she graduated from Stamford High School the year before I did. This was just the first Stamford coincidence of the trip. A brother and sister wanted to paint too, so I let them add a few dabs of green to the unpainted portion of the painting. Ran into the sister and her mother in the parking lot. The little girl was very indignant that I’d painted over her contribution. Checked into the camp. My site wasn’t exactly “remote”–it was ten feet from a country road. Oh well. Squirrels very fresh. 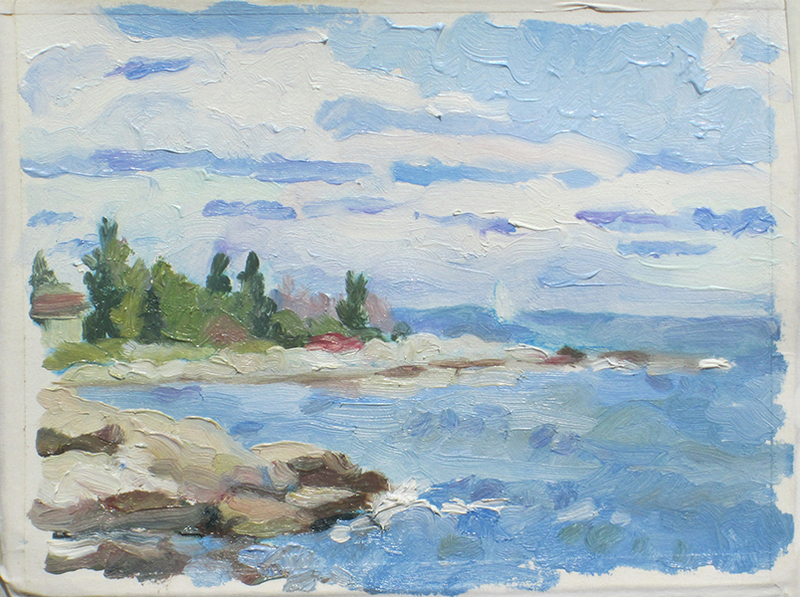 Went into Bar Harbor for lunch and then back into the Park for a second painting. Thunder Hole is the most pimped out spot in Acadia, a stepped, ramped and handrailed Natural Wonder™ worthy of Franconia Notch, It was still very foggy, even foggier than before, so I carried my easel onto the rocks and carefully framed my painting to look past Thunder Hole onto the rocks beyond, without even a hint of the tourist trap in front of me. Back to camp. The radio was predicting heavy rains that night so I set up a tarp over my tent. It never did rain. Come to think of it, the weather reports were reliably useless. A beautiful sunny day, but very windy. 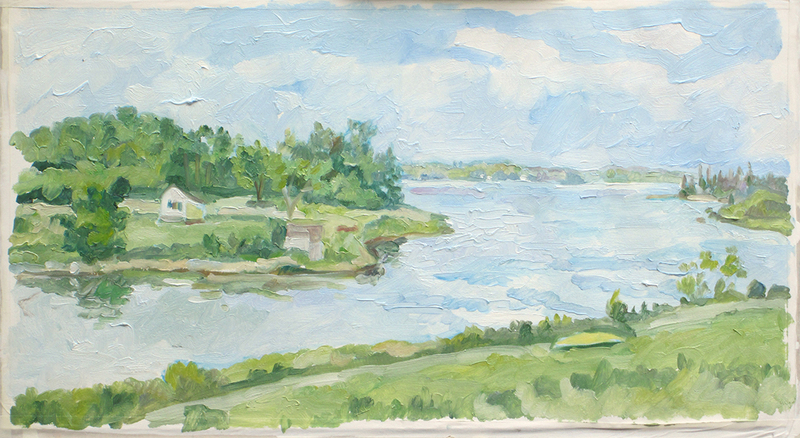 I had scoped out Jordan Pond the day before and went back first thing to paint. I made the mistake of doing a large painting right off the bat–I usually start with a small painting so that I have the energy to paint again in the afternoon. After battling the wind all morning and getting a nice sunburn as well, I was too exhausted to set up and paint in the afternoon. Went back to camp and took it easy. These trips all end up having a theme. Last year’s theme was “Getting Lost.” This year’s was “In Search of Breakfast.” I freely admit, I’m only a car camper, and I do like to have a cup of coffee and a nice cholesterol-laden breakfast before I start working. Earlier I had stopped at a diner called “Maine-ly Meat” (yes, I know, a really bad sign and a truly dreadful breakfast) because it was on my way. The next morning I drove past it and had to go eight miles into Bar Harbor before I found a restaurant. Eight miles without so much as a Denny’s or a Dunkin’ Donuts! And it’s not like this was a pristine back country road. There were souvenir shops and lobster roll places (that all opened at noon) a-plenty. Just, no diners. The next day I headed south in hopes of finding a diner. I went twelve miles before I gave up in despair, turned around and had another (yechh!) meal at Maine-ly Meat (by the way, there are a lot of places up there with “Maine-ly” in the name–Maine-ly Maine Jams n’ Jellies, Maine-ly Music, Maine-ly Maine Gift Shop–it’s the pun that keeps giving). Do you realize what this means? There is a twenty mile stretch of main road in Ellsworth and Bar Harbor where you cannot buy a cup of coffee and a bagel. I passed not one, not two, but three separate places where I could buy hand-made Cupolas and Weathervanes (thankfully none had the word “Maine-ly” in the title), but not a single place for a nosh. It’s an adjunct of Hell, I tell you. Back to camp for lunch and a nap. I chatted with another Stamford-ite, a science teacher at Westhill High School who had just retired and was full of glee when he saw the school buses drive by. His two complaints were about the elimination of vocational education in Stamford–apparently all students are considered college materials, even when they aren’t–and by the scourge of cell phone which has made the last few years a living hell for him. 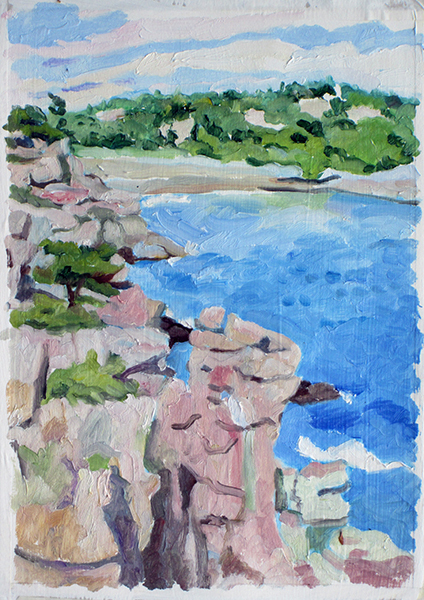 I got in one more painting in the Park, again overlooking Sand Beach. Initially I thought the painting was about the big stone monolith in the foreground, but as I painted I soon realized it was really about the scrawny little pine about halfway down on the left. I couldn’t face the thought of another tuna and cracker dinner back at camp so I splurged and had a huge dinner at a local restaurant. Bad mistake! When I got back to camp, before I even got out of the car there was a knock at my window and another acquaintance from camp had bought too many lobsters, had to cook them all, and was inviting me over for a fresh Maine lobster. I had to decline–I was that stuffed. That’ll teach me. I could have spent another week there painting, but alas I had responsibilities awaiting me at home. If/when I go back I probably won’t even bother to go into the Park. There’s enough natural beauty on Mt. Desert Island scattered promiscuously over the countryside to justify a dozen painting trips.